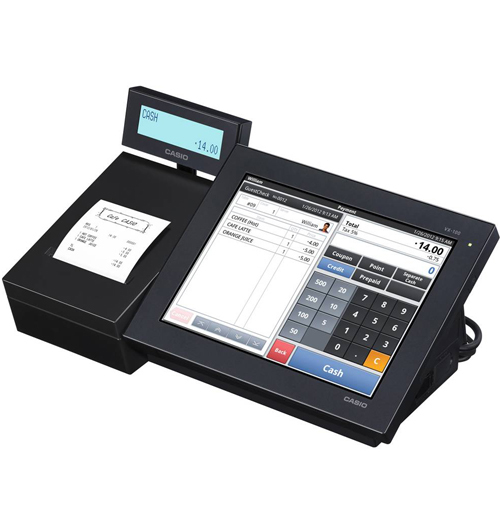 The V-R100 is an Android-based POS terminal designed specifically for the POS industry that offers both an embedded application and an open platform no hard drive or fan. The embedded application is a powerful application with new features not found on previous models, and it is designed specifically for hospitality and retail applications. The open platform allows the option for software companies to develop and run their software on the V-R100. The V-R100 is an Android-based POS terminal designed specifically for the POS industry that offers both an embedded application and an open platform. The embedded application is Casio’s software, designed specifically for small to medium sized hospitality and retail applications. The open platform allows the option for software companies to develop and run their software on the V-R100. Applications from third party software companies include table service, quick service, general retail and grocery. Additional highlights of the V-R100 include the 10.4″ operator color touch screen, a built-in 80mm thermal printer, a pop-up 2×20 customer display, an Ethernet port for high speed communications between terminals and the internet, multiple serial ports for peripheral commectivity, cash connector and an SD Card for program backup. Copyright © 2017 Cash Register/Systems Inc.